The RemZzzs CPAP mask liner acts as a barrier between your face and the silicone found on most CPAP mask cushions. Use the liner to reduce noisy air leaks and protect your skin from excessive moisture or embarrassing red marks. Made from 100% breathable cotton knit, this liner absorbs facial oils and moisture to prevent leaks and irritation around the cushion seal. Sometimes using a CPAP silicone cushion can lead to skin irritation or excessive sweating. The RemZzz CPAP mask liner is designed to help prevent moisture from developing, leading to less skin irritation and fewer mask leaks. The special blend of natural fibers wick away moisture and prevents conditions like cushion 'burping' or 'squealing', two types of cushion leaks that generate noise. The liner prevents the cushion from slipping and absorbs facial oils that would otherwise loosen the cushion seal. Each 30-Day Kit comes with 30 RemZzzs mask liners and (2) forehead liners. Use the forehead liner if you are experiencing red marks from you mask's forehead support. Each forehead liner lasts for about 15 days and you may use all sides of the forehead liner by simply turning it over or refolding to a new surface. 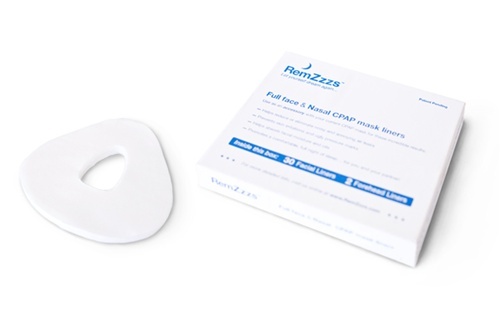 The RemZzz CPAP mask liner comes in Small, Medium, or Large sizes for several of the top manufactured masks on the market. Each order comes with a 30-day supply of RemZzz liners specific to your size mask.